Like Crazy este o drama romantica regizata de Drake Doremus, cu Anton Yelchin, Felicity Jones si Jennifer Lawrence in rolurile principale. Filmul a castigat Marele Premiu al Juriului la Festivalul de Film Sundance din acest an. 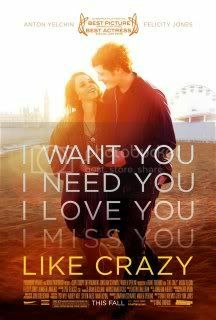 Like Crazy va avea premiera pe 28 octombrie 2011. Share the post "Like Crazy"
← The Ides of March – trailer! Rattling nice style and design and excellent written content, hardly anything else we need :D.
I really like your writing style, fantastic information, regards for posting :D. “He wrapped himself in quotations- as a beggar would enfold himself in the purple of Emperors.” by Rudyard Kipling. Can I just now say that of a relief to acquire somebody who in fact knows what theyre speaking about on the internet. You actually realize how to bring an situation to light and generate it essential. Workout . need to look at this and fully grasp this side on the story. I cant consider youre no extra common because you definitely contain the gift.